Alwa z Eurosportu and Ebigeill z Get Pet and our newest girl, Lady Liberty Vomweiland will be bred to Alan Schrom sometime after April, 2017. A photo of Alwa X Alan Schrom previous litter taken when they were six weeks old is on the right. Our clients get regular videos of the progress of each litter, so that they can see the growth and developmental progress of each pup. To see other YouTube videos of other litters, go to YouTube.com and search for Vomweiland O litter or VomWeiland P litter, or any letter up to the letter P to see other litters of GSD puppies. Alwa z Eurosportu X Alan Schrom pups at 6 weeks. The barrier is 16 inches high. These were HUGE puppies! 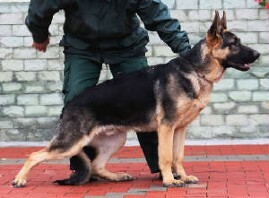 Our goal is to provide the best German shepherd puppies that we can produce. To that end, we provide meticulous prenatal care and nutrition to the pregnant dam, followed by intensive socialization of the puppies, including play with a wide variety of toys, supervised play with children, trimming of nails, tattooing of their ears, and potty training. Evidence that we have been successful is our Testimonials page which has many notes from happy puppy clients. Also, check out our reviews and testimonials on yellowpages, then click REVIEWS and read over 30 reviews submitted by happy owners of our puppies. 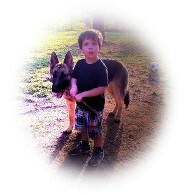 We strive to breed the best German shepherd puppies possible. Read the Diary of a German shepherd puppy to get a sense of the intensive care that we give our puppies. Call 252 964-2514 to speak to Sandra Weiland to inquire about placing a refundable deposit on any of our future litters. See a 5 minute visit to part of our kennel that shows you the baby book that we make for each pup. We have one page for each week the pup is with us. We insert a puppy paw print at the beginning of each week. We add daily weights, and document all procedures, such as nail trims, worming, vaccinations. The book starts with photos of sire and dam, followed by pedigree of sire and dam, titles and achievements of each of their Slovakian ancestors. Next are the 9 weeks of the pup's life, with milestones described, and notes on each puppy's behavior. We send three videos a week to our clients, starting at 4 weeks of age, to help them choose their pup. 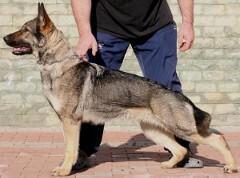 Ebigeill will be bred in the late spring to our German shepherd stud dog, Alan Schrom, IPO3. Past Litters: Click to see previous litters and puppies we have produced. As German shepherd breeders in NC, we have been blessed with great Czech Slovakian imported females, and an outstanding German shepherd stud dog, Alan Schrom, IPO3, also imported from Slovakia. Contact this German shepherd breeder by email, or preferably call 252 964-2514 to discuss making a deposit on one of our German shepherd puppies for sale in NC. Check out our Planned Breeding page. 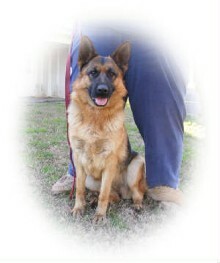 We are hoping you will choose us to be your German shepherd breeders in NC. 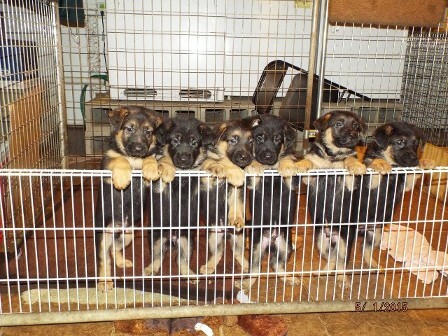 We are taking deposits for our upcoming litters of German shepherd puppies; we are still able to accept a limited number of deposits to be guaranteed puppies from these litters. Remember, all deposits are refundable, should your circumstances change.